It’s currently a mess of scaffolding and attempts at order, but some thoughts are getting in there. Please see the SVA website for details about TWO continuing education classes I am teaching this summer, and one undergraduate class. First, a solo class called a bit oddly, The Semiotics of Sequential Art: How Comics Rule. Monday evenings. This class will be about finding your voice, about following, focusing and articulating your idea in comix. I bring in tons of work to pour over, we begin with a number of quick exercises to get us going, then work on longer projects towards the goal of a single large-scale piece. It’s always a good class. Next is the SUMMER INDEPENDENT STUDY SEMINAR that I am co-teaching with Lauren Weinstein. This class, begun last semester by Matt Madden was a great success, and Lauren and I will continue it this summer, helping self-motivated students develop and finalize their longer projects. PART 1 of an article in progress. There is a book by Yoshiharu Tsuge that I have never read, called in French- “L’homme Sans Talent” -The Man With No Talents. I’ve seen it in French and its original Japanese. My French being awful and my Japanese non-existent, I have barely penetrated this world, but I am absolutely obsessed with this above image and what I can read of the story. I’ve gone to friends’ houses, I’ve sought out this image so I can just stare at it, like a 3 year old transfixed by a scary doll or damaged stuffed animal; I’m obsessed with a simulacrum of a human. I stare at it. Who is this man selling stones? What brings a cartoon man to this point in his life? Why is he lying like that, in that strange position, and composed of those scratchy short lines? I gaze at this drawing and try to answer those questions on my own. I look, ask and imagine. And then I realize: what Tsuge has created with this simple panel is a space in my heart for a new story to appear. And when I look at this man without talent I know one thing, because my spirit knows about a story: that some other character or object or beast from this same linefield will intrude upon this character’s world and story. Some other beast must emerge to confront in a new way, this scratched, sketched-out man. It will probably be some visual and immediate thing, but it could come from his own memories (full of other creatures and things, no doubt) or his own concerns- newly manifest from the alchemy of his own thoughts. A beast in spirit, a beast-thought. But something will emerge from the linefield to become story. Forcing myself through this story, in a new language of lines, light and shadow and little (computerized) French squiggles, I’m propelled to slow down and immerse myself in the meaning. I’m in the perfect frame of mind to take in artwork: immersed in form and content, slowing down, perceptions open, looking for meaning. This new language IS the linefield. The linefield is about finding meaning, sometimes found whether you search for it or not. Trying to read Tsuge in French is like trying to read Rege in english. Puzzling and troublesome, yes, but something is shimmering and calling out for attention, suggesting meaning where you might have thought you just saw a drawing, a doodle, or an tiny unimportant foreign word. In Rege’s Against Pain, or in a slow-moving master work translated into a unfamiliar language, every millimeter seems to speak. The first story (or chapter?) begins on page 5 of the volume itself (I’ll use that method of numbering from now on) and is a title page. Along with the title, “Le Marchand de Pierres”- we see a landscape in a ceramic pot. The shine and man-creafted shape tells us it’s ceramic, but set in there, a landscape of streams and crevices and plateaus, is it a rock? Atop that, the silhouette of a man (I think, from the broad shoulders) in a hat, seated still. Is this a real landscape and a normal sized man? Or a small rock and a tiny, tiny abstract person? Anyway, it’s totemistic- it’s inviting us into the story. Page 6- Our man, lying down, on a rocky beach landscape, beneath a tarp, stones for sale to his right on small boxes and shelves. Behind him, a sign in Japanese on a pole, a bird in flight, silhouetted. The next panel zooms in and flips our view of the sign on the pole. Thus, are we looking from the sea shore? Are we the bird in flight? It stretches time or space, maybe both, doing this. On the sign: “stones.” My struggle to read the computerized French caption is minimal: I became a seller of stones. But at the start of that sentence, does “pour finir” mean “finally” or “in the end” or even “in order to finish?” Each incarnation means something new: resigned in the first two possibilities, or something more willful in the third. Panel 3 of this page- a close up of the stones. Suddenly they are higher in contrast, and differentiated from each other. Some are splotchy, some textured with thin gradations, some lumpy, some smooth. A price adorns each rock. Everything depicted in the story up til now sits there stock still, solid, a heavy, deadened part of some otherwise transient (ocean, river currents, wind currents) landscape. Page 7, a giant silhouetted crow with a berry or stone in its beak rests on a wooden pillar. These pillars line a road to the back of the space of the panel. The atmosphere in the sky and/or water is troubled with lines, but the crow is unbothered. In the text, the man says he tried other things- some sort of cartoonist, some sort of photographer, nothing worked. Man is bothered, nature unmoved. The man is viewed closer and closer, seeming more like the first vision of him we saw. He has read some books on selling stones, it doesn’t cost anything to begin such an endeavor, he thought it was a good trade for him. Our last view is presumably his view, looking onto a small marshy area of reeds, plains and water. We’re fully in this man’s world now. As his lines and shadow assemble to re-form him panel after panel, he makes his way through his new chosen profession. Gardner’s point being that Poe frees us from needing to know WHY things happen (his example being The Cask of Amontillado)- freeing us cartoonists to stretch reality, to imagine impossible realities. Did Poe free McCay to imagine a boy whose very sneeze could overturn elephants, or Herriman to imagine a brick-throwing mouse? 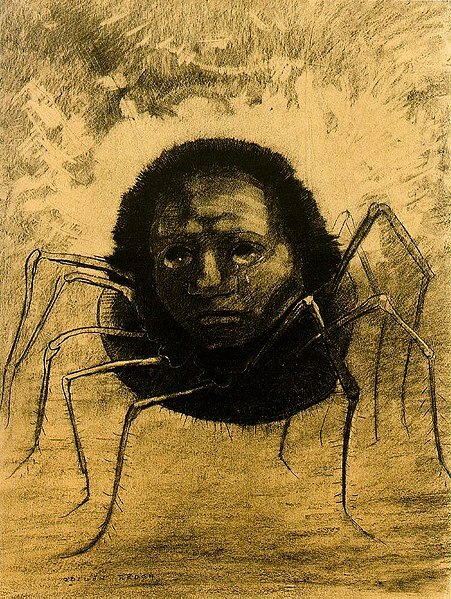 Did Bosch’s nightmare creatures have anything to do with it- did Odilon Redon free our line medium to explore its fantasies? Words and pictures, fiction, etching and painting. All these entangled histories in our comix world. My feeling is that no one defines for the young artist what art is for. This is a good approximation above. We create to communicate with our audience -in back and forth dialectic and poetic, psychological, metaphysical discourse- what it is to be who we are. And at other times, we create for others an object for study and amusement. This different kind of creation is no less a gift to our readers, but is best done as mindfully as possible. But what is it in comix? Show me one thing- it’s not one thing. These two things “logical progress” and “event-sequence” are found in comix, but so too poetic, visual connection, etc. I’ve been interested in the subject all my career. Where can you locate the answers to this question in comix? How long can a piece be before it NEEDS human drama? How little might it need? What are the limits of “real-world relevance”? How can we both honor and evade it? (This post seems to have been written and unposted. It dovetails well with my recent post about The Linefield, so I’m posting it now. I recently saw The Day I Became A Woman, an Iranian film by Marzieh Meshkini (written by her father, Mohsen Meshkini), a film in the three parts on the theme of womanhood in rural Iran. This and another play I saw the same week, Top Girls, by Caryl Churchill both remind me of my initial instincts as a storyteller, or as a non-storyteller, let’s say. The Day I Became A Woman features three separate stories, with the gentlest of “story arcs” in them at all. In part 1, “Hava”, a young girl conspires during her last hour as a child (before she turns 9) to play in the dirt with her male friends. After she turns 9, she must don the chador, and hide from male attention. Indeed, the entire section involves Hava playing her last hour away. Part 2, “Ahoo” features a woman in a bicycle race. Her angry husband rides up on horseback, demanding she put a stop to her evil ways. He divorces her (while still on horseback), and her older family members and then members of her tribe all ride up to her demanding, requesting she return to her man. Finally, in the distant final shot, her brothers come and put a stop to her pedaling, and take her away. Part 3 “Hoora”, an old woman buys a bunch of furniture and appliances she never had, arranges them on the beach before putting them and herself all out to see on makeshift boats. When I began writing stories, or when I began consciously doing so anyway, after “Hutch Owen’s Working Hard” I wanted as LITTLE STORY AS POSSIBLE. What I wanted was character, poetry, poetic image, images, internal surprises. I tried my hardest to chase this dream in New Hat, and The Sands. In New Hat from 1994, also a three part story, my main concerns were contrasting rhythms and formal structures, and crashing sequences of narrative which may or may not relate to the others. Part 1 of this book was the most like this movie, I think: a man gives a last diatribe before being stoned to death, and then we see a local daydreaming belltower operator rise up and do his job. it’s probably my most successful small piece of storytelling. It meant little specifically, but raised lots of emotions legitimately and put them all in the same frame. The Day I Became A Woman doesn’t feature the same range of simplistic emotion; instead it features more human characters, deeper insights to the human heart and the societal mind, both things I was shooting for. A continuum all these works vacillate on is Drama vs Poetry. Drama is the manipulation of characters and events in opposition with each other. In its most extreme, it is superficial and distancing: tired action movies about good guys and bad guys. In it’s best examples, characters are deeply drawn and communicate, questioning and exploring the themes of the drama both in their behaviors and thoughts. Poetry I would argue is the single image designed to provoke or evoke other impressions and ideas in the mind and inner eye of the audience. Poetic image is created using the images of our society: people, places, and time etc. At its most extreme and superficial, it is cloying, simplistic, Hallmark cards and childish posters. At its most astute, it uses hints of drama to offer up enough action, enough motion and opposition between the characters and other elements to suggest worlds within the audience and to allow meditative space within them. I have spent most of my career thinking of this continuum, and have spent most of time WAAAY believing in the far end, toward the poetic. I was never the kid in rock bands, never the kid reading or writing sci-fi. I was spending my adolescence in the bath tub listening to Brian Eno’s Ambient music and traipsing around the woods trying to resonate with what I found there. In one wooded area around me, there was an old living room chair, rotten and stained. I never once imagined who might have put it there. I never thought til now that there might be a story behind it, that there could be long dramas behind the decision to abandon this furniture, and the action of getting it there might have been something one could image, watch or engage with. All I wanted to do was allow it to make me feel something. The simpleton’s response to the world: how does it make me feel? So my earliest stories and sketches were light on drama-as little as I could get away with, with as few specifics as possible. This was often unsuccessful, as you could guess. Still, I believed that this was all training to go back to attempting to create the poetic image, the story that exists outside of specific narrative, and in a an internal landscape in the viewer. But I still tried to learn the tools of drama, and to this day I tell my students to write over the top. To imagine the murder, the betrayal, the villain, and then to write down if need be. To tone down the drama once the extremes have been entertained and rejected. And some 10 years or so since beginning this experiment (I would say since I closed the book on The Sands – wildly unsuccessful, though fun) I have yet to reattempt the piece where poetic image is the main core of the story. Artists who do this well: Tsuge, first and foremost, though his peer Yoshihiro Tatsumi does it well also. In Western comics, I always though Anders Nilson was getting there (though I haven’t finished his Big Questions). Ben Katchor, obviously, Ron Rege, Chris Ware. As others come to mind, I’ll post them here. I have dozens of notebooks and boxes of index cards all vibrating with the potential to be that next poetic comic. So what am I doing doing comic strips? Soon or maybe never: Part II. What I am doing doing comic strips, Top Girls, and how form can be the poetry. And note to younger self: why on earth wouldn’t “poetic image” involve DRAWING?